Every dollar counts in this economy, especially if you’re like many of the senior working class. Our children are out of the house via college or corporate job, and retirement is closing in fast. But while some may have a nest egg to fall back on, those of us without a college degree are more in need of a golden egg. There isn’t much money to just throw away, so when looking for a car, you’ve got to be practical. If you have credit challenges, you have to be sensible and realistic. Finding a company that provides second chance auto loans won’t be difficult. Finding those loans with reasonable rates may take some research. There are many factors to consider when trying to secure a car loan. However, one of the most important is probably the interest rate. It determines how much you will ultimately pay for your car. Most times the rates you will pay are tied closely to the credit score you have. So, the first order of business is to find out what your credit score is. Prime scores will get the better bargain, but just because you don’t have a 700 FICO doesn’t mean you don’t deserve a good deal. The trick is to get a preview of what kind of rates you should expect for your credit score. Call your bank or check the paper, but know before you go to keep from being blindsided by high rates. There are auto lenders like RoadLoans that specialize in less-than-perfect credit. All credit types are accepted and they allow you to customize your loan, creating a payment that fits your budget. The online application process is safe, secure and the rates don’t fluctuate. What if you’re already tied to a car loan that has a higher interest rate than you bargained for? Auto refinancing may provide some relief. Find a new lender with a lower interest rate. With companies like RoadLoans, the application is so easy, you can have it filled out in minutes and get a decision in seconds. 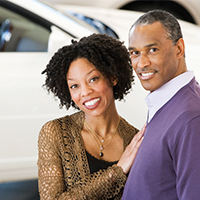 Before long, you can have a lower car payment and some flexibility in your budget. The golden years shouldn’t be eclipsed by the fear of second chance auto loans and their rates. You don’t have time to miss out on the fun of double-dating or tailgating at your favorite sporting event. Do your research and find the rates that will allow you to pay your bills and live your life.